In the middle of September this year, the focus for the commemorative celebrations of the 150th anniversary of Rossini’s death moved from Pesaro to Lunenburg, Nova Scotia. 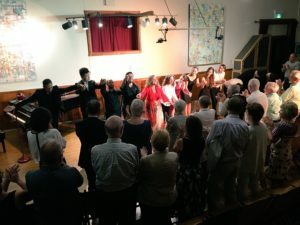 At first it might seem odd to have a Rossini Opera Festival in a small town in Nova Scotia, but when you meet the heart of this festival, Burt Wathen, you understand all the logic behind such an endeavor. A native Nova Scotian, Burt was one of the founding members of Symphony Nova Scotia. He also served as principal violist for 26 years in the orchestra of Teatro Comunale di Bologna, the principal orchestra of the Rossini Opera Festival in Pesaro for many years. It is understandable that Rossini is in Burt’s DNA. 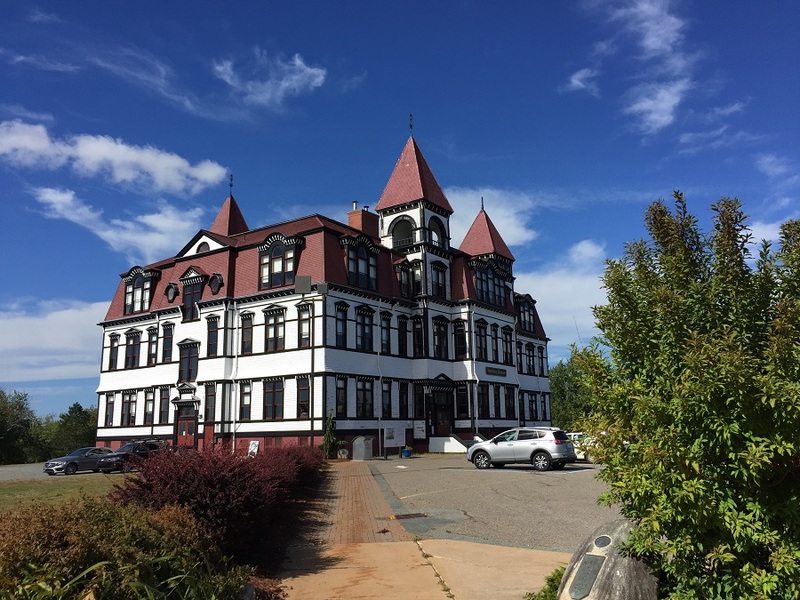 It doesn’t hurt either that Lunenburg is a charming picturesque little town, a UNESCO World Heritage Site on the southern shore of Nova Scotia. A vacation can be easily crafted around the Rossini Festival there. It is understandable that Rossini is in Burt’s DNA. The Festival was in its inaugural season this year, as it expanded from the previous 5 years of Rossini Opera Academy held at the Lunenburg Academy of Music Performance(LAMP). In previous years, students interested in mastering Rossini style could participate in the Academy lead by Rossini Alberto Zedda and then diva par excellence Daniela Barcelona. The Festival this year expanded in scope, with an opening night gala, a soiree in Rossini late Parisian style, and two staged performances of this year’s opera “L’Italiana in Algeri”. Before the start of the Festival, bad luck made a brief appearance at the Festival. As in the previous year, Daniela Barcellona was scheduled to lead the academy and sing in the opening night gala. Unfortunately, she became injured just before the Festival, and with tears in her eyes and voice had to cancel. Some students also had difficulty scheduling travel or were sick and could not attend. The good fortune however also stood by LAMP’s side, and the remarkable mezzosoprano and Rossini specialist Sonia Ganassi came in on short notice to instill wisdom and stage experience into the festival. The renowned pianist and vocal coach Richard Barker also came in on a 36 hour notice to train singers in the Academy. He worked with prepared the singers during the first week of the Rossini Academy. Unfortunately he had to leave and could not be present during the Festival to see the fruits of his work. Seen in the photo are students of this year’s Academy with Michele D’Elia ( front left) and Richard Barker. The opening night gala showed what an extraordinary event this Festival was setting up to be. The high quality of the musicians performing and of music presented in the gala rivaled one in maybe more prestigious places. First, Sonia Ganassi’s rich and round mezzo went directly to the soul, her interpretation, vocal line, breath control were of the highest standard. One wonders why is she not more present on the North American continent, and what can be done to hear her more here. Her selections were the emotional “O mon Fernand” from Donizetti’s La Favorite, the duet “Qui tollis” from Rossini’s Petite messe solennelle with soprano Chelsea Rus, and “O don fatale” from Verdi’s Don Carlo. Singing of such vocal and interpretative quality can only be heard in the best opera houses of the world, and Lunenburg LAMP is a pioneer off the beaten path in offering such riches. One might say that a star like Sonia Ganassi can only offer performances of highest quality, but what about the other performers? Indeed, the other performers were current of former students of the Lunenburg LAMP Rossini Academy. The quality of voices and the maturity of interpretation is making them deserving stage colleagues of Sonia Ganassi, particularly the men. With young singers such as bass Shi Zong and baritone Josue Ceron, Rossini’s future is in very good hands. Opening night offered a collection of Rossini arias such as Asur’s aria from Semiramide masterfully delivered by the booming bass of Shi Zong, Alidoro’s aria from Cenerentola sensibly presented by Josue Ceron, as well as Berenice’s aria from L’occasione fa il ladro sung by former student, soprano Chelsea Rus. The evening also included the delightful Chanson de Zora from late Rossini’s “Peches de Vieillesse” brought to life by coloratura mezzo soprano Marie-Andree Mathieu, and the Dandini/Magnifico diet from Cenerentola playfully sung by Josue Ceron and Shi Zong. The evening concluded with the finale from this year’s opera L’Italiana in Algeri performed by this year’s young artists. Piano accompaniments for the opening gala were provided by the Academy’s coaches Louise-Andree Baril and Michele D’Elia. It is hard to pick the best moment of this Festival, from the opening night to the last performance of this year’s opera of the academy my expectations were greatly exceeded, and all performances were of the highest quality. 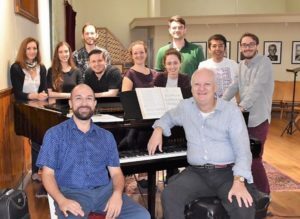 The two performances of “L’Italiana in Algeri” closed the Festival and were the finale of the 2018 Rossini Academy. These performances were the culmination of almost a month of work on the part of the students of this year’s LAMP Rossini Academy. The performances were staged in the intimate recital hall of the Lunenburg Academy, and were performed with piano accompaniment. One might think that a piano accompaniment will be a poor substitute to a full orchestra performance of the opera. And that might be true in almost all other instances. However, when the pianist is Michele D’Elia, principal coach of the Academy of the Teatro alla Scala in Milan, a passionate and very knowledgeable scholar of Rossini, the piano becomes a full orchestra. The entire spirit of the music and the full nuances were present in the most sublime way. Words cannot describe how incredibly nuanced his playing and directing of the singers was. 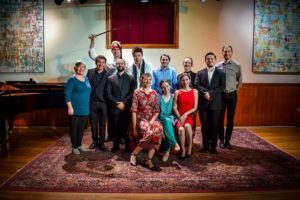 If many times, even at greatest opera houses, performances of Rossini’s operas leave a lot to be desired in terms of capturing all the wit and subtlety that imbues the music, that was not the case at Lunenburg Rossini Festival. The entire spirit of the music and the full nuances were present in the most sublime way. From the very first note Michele hit on the piano one could tell that Rossini was present in spirit at Lunenburg and was smiling. The singers too were first class. In the role of Mustafa, the Bey of Algiers, Shi Zong sang the first performance with a booming bass and a perfectly timed comedic act, while the second performance he was competently sung by American Joseph Trumbo. His sidekick, Haly, the Bey’s guard was the Russian baritone Timofey Pavlenko who also was vocally very solid and had a mighty good time performing. As Lindoro, both performances were sung by the Mexican tenor Enrique Guzman who displayed all the vocal pyrotechnics and squillo needed for high tenor writing of Rossini, reminding at times of a young Juan Diego Florez. Josue Ceron was a delightful Taddeo in the first performance, and Ariel Lefabre played him in the second one. Even though the ladies were not on the same vocal size as the men, they held their own honorably. Isabella was sung with aplomb by the Canadian mezzo Sarah Bissonnette, Elvira was the delightful French soprano Marjolaine Horreaux while her confidant Zulma was the sweet mezzo-soprano Veronika Anissimova. Overall there was a very strong feel that everyone on stage was having a great time, and they all collaborated with each other extremely well over the course of the academy. In the middle of the festival, LAMP prepared a veritable soiree in Rossini Parisian style. For this feast they invited the celebrated Canadian actor Bill Carr to play the role of Rossini himself. The evening was set as a play, with Rossini monologuing in a thick Italian accent on his life and creation, interspersed with musical numbers taken from his later creations for chamber music. The intimate salon music is grouped in the 14 albums named “Peches de viellesse” (Sins of Old Age). Singers were interpreting the musical pieces, while being in character as Rossini’s acquaintances and singers. We were enchanted by characters such as sisters Marchisio (Carlotte and Barbara), Jean-Baptiste Faure, and piano genius of Louise-Joseph Diemer, as well as Camille Saint-Saens. While such an endeavor can easily become tacky, in this case it was the most genuine and successful attempt to recreate a soiree feeling inside the recital hall of LAMP. Most credit should go to Bill Carr who impersonated Rossini with true ingenuity, and who created the monologues that detailed aspects of Rossini’s life, as well as the historical place of musical pieces heard that evening. And the music presented was a selection from Rossini’s “Sins of Old Age” including six of the multiple variations on the text of “Mi lagnero tacendo” by Pietro Metastasio, a piano solo composition of Rossini’s younger colleague Louis-Joseph Diemer skillfully presented by the evening’s pianist Geoffrey Conquer, and ended with “Danse macabre” of CamilleSaint-Saens masterfully interpreted by Lunenburg’s own Walter Delahunt. Overall, the standouts of this year’s Rossini Festival in Lunenburg, Nova Scotia were basses Shi Zong and Timophey Pavlenco, baritone Josue Ceron, tenor Enrique Guzman, these young men will carry Rossini’s music admirably in the future, and have great potential to be heard on biggest stages of the world. I will always seek any performance of the pianist Michele D’Elia, as well as the magnificent Sonia Ganassi. Big tip of the hat to the soul and visionary of the Festival, Burt Wathen, true and passionate lover of Rossini’s music who achieved almost the impossible in creating a first-class Rossini Festival in Lunenburg, NS. And if one needs any more convincing to go to the Rossini Festival in Lunenburg, the beauty and charm of the place are hard to match.